Happy Chinese New Year! 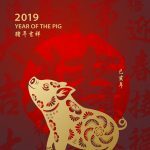 Monday's Aquarius new Moon will set the stage for Tuesday's Chinese New Year, celebrating the year of the Pig. This is the last of the 12 Chinese zodiac signs, and promises a year of wealth and luxury, assuming we don't get too lazy and let new opportunities to expand our worlds pass us by! The element associated with the Pig is Earth, promising a stabilizing force in all we do. This new Moon is ideal for networking, meeting new friends and getting our plans for 2019 off paper and into reality. Wednesday and Thursday carry a spiritual tone under the Pisces Moon, while the remainder of the week carries a high energy under the Aries Moon, another aspect to help with new beginnings. On Sunday, Mercury will move into the sign of Pisces, again reminding us that as above, so below. Our thoughts and soul will come into alignment during Mercury's run through this sign, allowing us to move with more power and karmic grace.